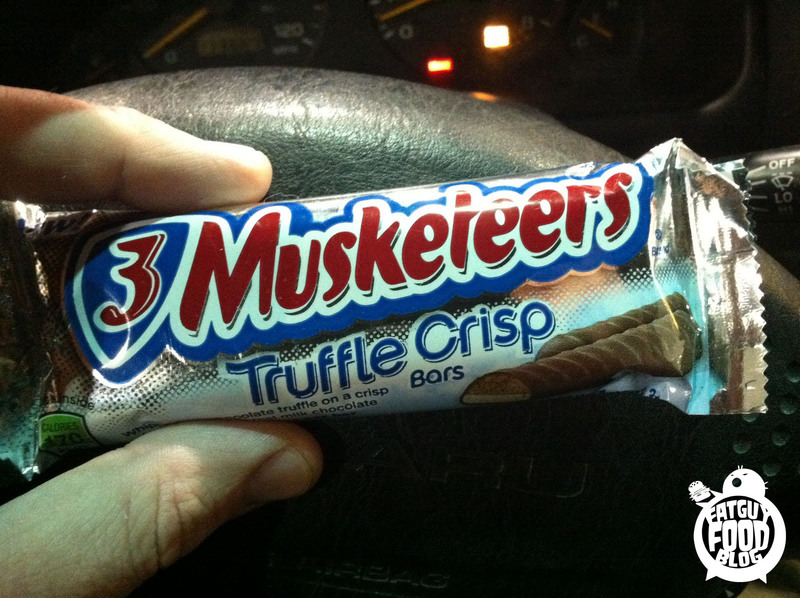 3 Musketeers Truffle Crisp bars. I have been seeing these for a bit in the stores but since the usual 3 Musketeers candy bar does nothing for me, I wasn't excited to try them. But once you start writing for a fat guy food blog, there is an automatic excuse to try any and all things new. So...I did. Well they aren't that good at all. 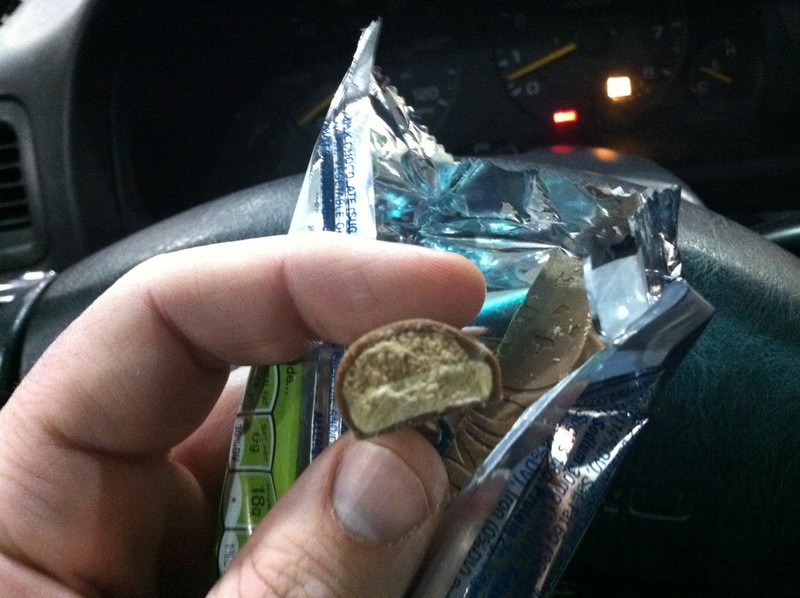 They give you two slim bars. Both of which feel so light that a stiff wind could carry them away. Well they taste like someone cut slivers of that Astronaut Ice Cream that you can get in museum gift shops, the freeze dried stuff. 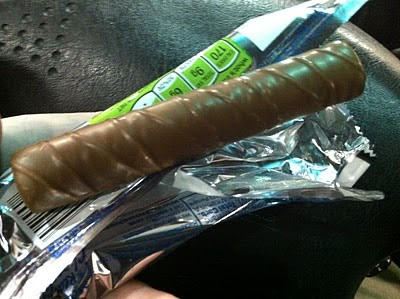 Then they take those slivers and put a thin layer of the nougat from a regular 3 Musketeers bar on top, then cover it all in a very light chocolate. So it pretty much disintegrates in your mouth after the initial bites. Crunch, crunch, liquid. I just didn't find anything satisfying about this. I'm glad I tried it because I strive to try all new and strange snacks, But don't expect to see me around town munching on one of these any time soon. 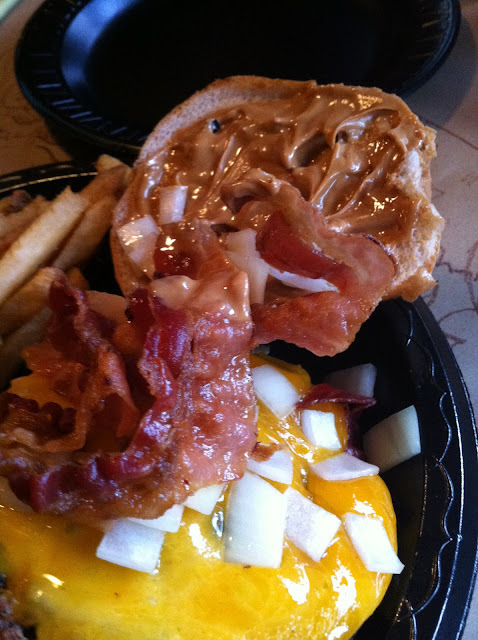 KC's Rib Shack: Ever had a burger with Peanut butter as a topping? 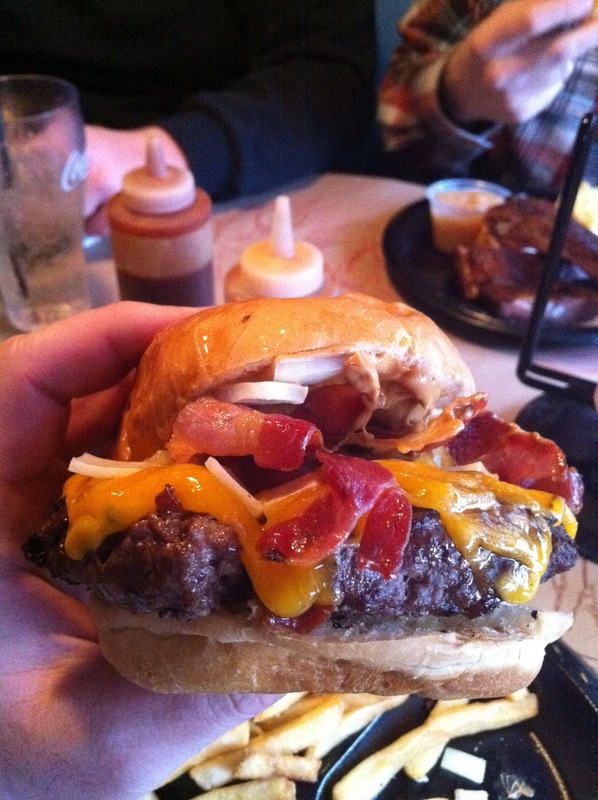 A week or so ago the FATGUYFOODBLOG crew hit up KC'S Rib Shack in Manchester, NH. Why did we go there? Well we found ourselves watching a Phantom Gourmet marathon and during the segment on KC'S, they showed not only its various bbq delicacies but also a few of their more ridiculous menu items- like the burger that has peanut butter on it. 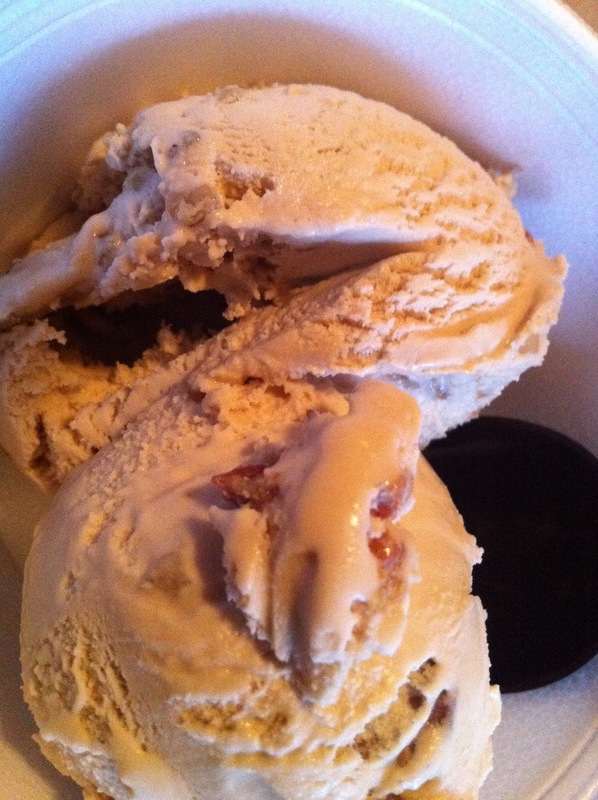 Oh, and Maple Bacon ice cream. Fast forward two hours and we're sitting at a table in the place waiting for our food. It was delicious. Not in that "I'm eating something weird that shouldn't be good but isn't THAT bad so I will say it's really good" way either. It was legitimately good. The actual burger itself was delicious. You knew you were getting a serious burger and not some frozen patty that came off of a truck. It was some delicious lean ground beef, smothered in cheddar cheese and onions with crisp bacon that wasn't so thick that it was hard to eat and not so thin that you feel screwed over after eating it. Top it all off with peanut butter and mayo and somehow it all congealed together into a mouth watering beast of a burger. If I had one complaint it would be that I wish they had grilled the onions. They were slightly distracting from the burger as a whole. Pretty delicious. I'd absolutely recommend trying it out if you get a chance! You can find KC's on the net, where they have a website full of weird pictures and flashing stuff. This post will be the complete opposite of Rich's previous post. The beauty of fatguyfoodblog is that although we're pigs who jam candy into our faces like it's air to a dying man, we still have differing opinions. 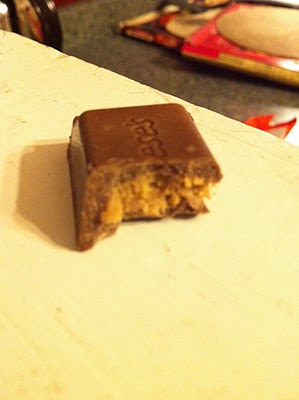 I have always been of the opinion that too much peanut butter in a chocolate/peanut butter mixture is bad- that the beauty of Reese's candy is the perfect marriage between the two flavors. Chocolate is the glue that sticks flavors together- the one constant in a chaotic world of sugar variety. I feel like too much peanut butter sends this perfect harmony into chaotic discord, and you're left eating just a giant pile of peanut butter. I like a perfect ratio. 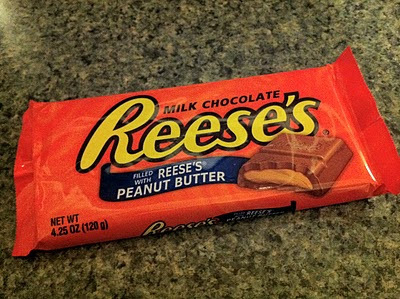 For someone who respects the perfect relationship between chocolate and peanut butter like me, these ruled. I think I still prefer the mini ones I get in candy canes for Christmas, but these are a fun snack. The bag will be gone INSTANTLY though. The idea is neat, but they decided to add a weird cookie-esque crisp that vaguely resembles a fortune cookie. 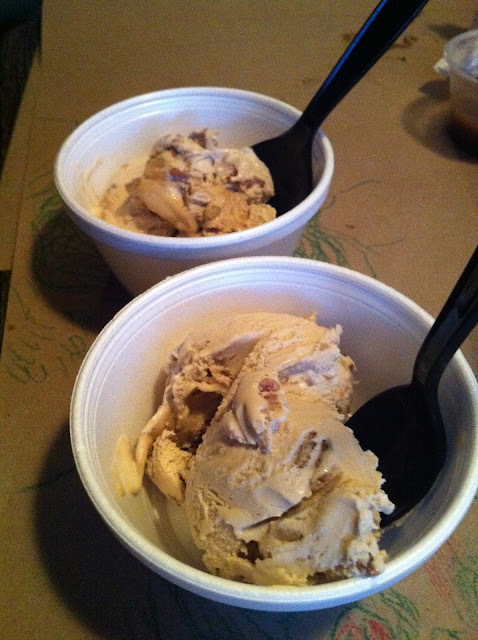 So, it goes: chocolate, fortune cookie, tiny amount of butterfinger, and peanut butter. They're a decent snack, but for Butterfinger, which is one of my all time favorites, they don't live up to the name. 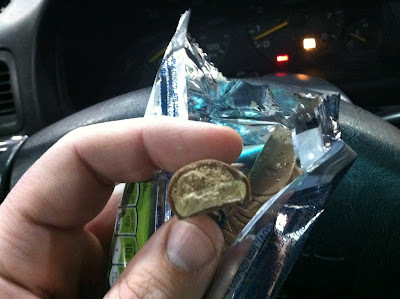 The last creation Butterfinger had was Butterfinger BBs, which, for someone who likes mini versions of awesome, ruled. Man, I now miss the hell out of these. So, yea. Butterfinger snackers- worth a taste for something different, but I won't be buying them again. They really seem like just a random peanut butter snack instead of being a variant of Butterfinger goodness. 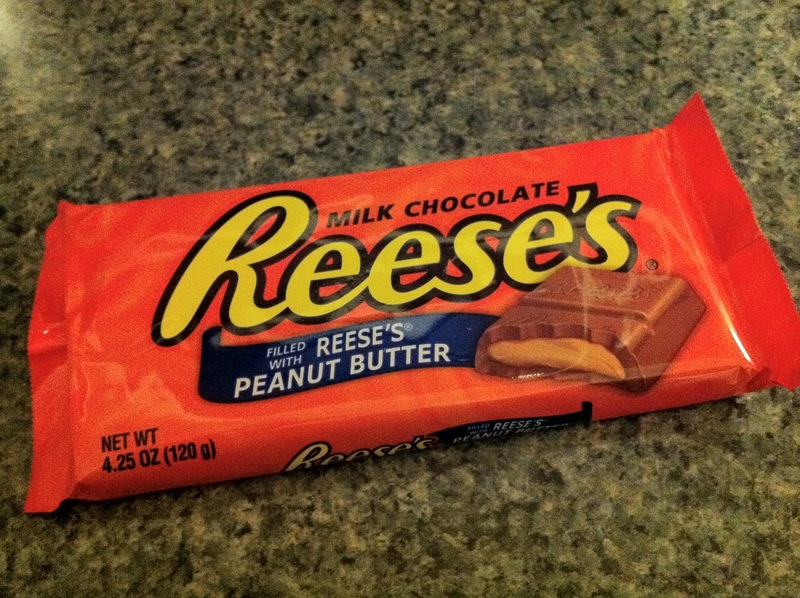 The reason I wasn't a huge fan of this, even though I love almost everything with a Reese's logo on it, is the peanut butter to chocolate ratio, for one. There's too much chocolate and not enough peanut butter. In an age where we are spoiled with the heavenly treat that is the BIG CUP, when faced with something like this, I scoff at it. 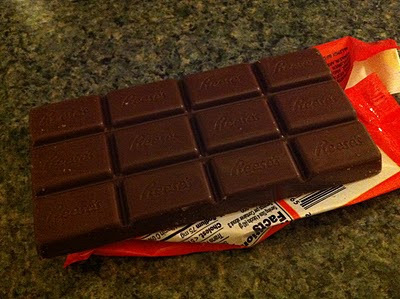 The chocolate is nothing special at all, definitely not the same that they use in their cups. It was less flavorful and even a little bland. The peanut butter was a bit more dry than usual and despite what my picture shows here, there wasn't enough in it. There were some bites where I wasn't sure I could taste ANY. 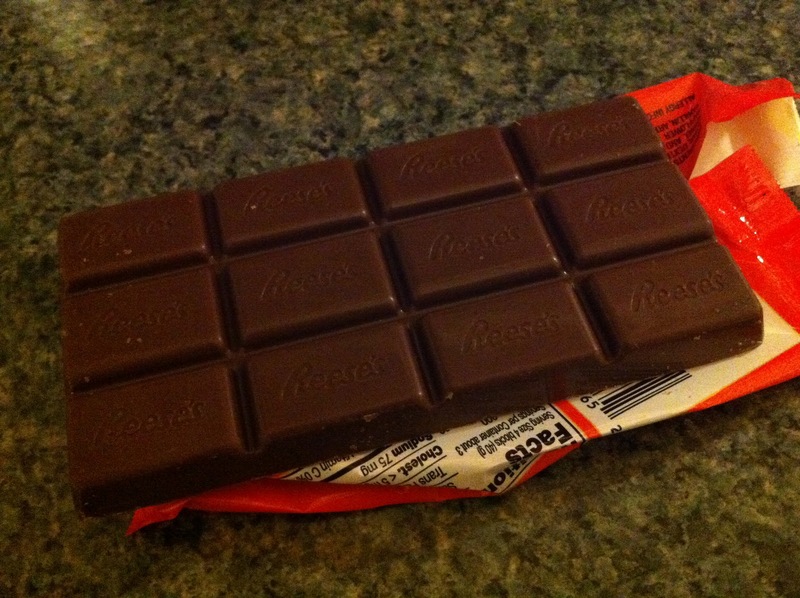 In closing, I would eat this candy bar over something like a plain Hershey Bar. But as far as Reeses Products go, it's at the bottom of the list. The Big Cup is king, and the rest fall in under him. All hail king Big Cup. I give this a D on the candy bar scale. For Disappointing.